Untitled II. 17.5×17.5″, chain print, 1968. Untitled III. 20.25x 20.75″, chain print, 1968. Untitled IV. 23×8″, chain print, 1968. Untitled V. 19×9″, chain print, 1968. Tea and Sympathy. 16.5×27.5″, screen print, c1968. HP Drawing 1. 15×15″, plotter print, 1969. Intergalactic Traffic Sign no1. 48×48″, enamel, 1970. Intergalactic Traffic Sign – Deer Crossing. 48×48″, acrylic, 1971. Intergalactic Traffic Sign no6. 48×48″, enamel, 1972. Intergalactic Traffic Sign no7. 48×48″, enamel, 1970. Intergalactic Traffic Sign – Jungle Madness. 48×48″, lacquer, 1976. A Flea in Her Ear. 19.625×28″, screen print, 1970s. John Dean. 18.5×27″, offset lithography, 1975. Hampton Roads Juried Show. 14.5×26″, screen print, c1980. Negative Impact of Technology. 17.5×21″, collage, 1973. Technology Connection ODU. 18.5×28″, screen print, 1977. Too Much Juice. 25.5×24.5″, ink, 1977. Viva America. 28×21.5″, off-set lithography, 1976. Are You Norml? 17×25″, offset lithography, 1970s. Dracula. 19×25.25″, screen print, 1975. From Robert’s 2003 Artist Statement. . .
“Gosh, an opportunity to say what I was thinking 30 years ago! Well, naturally, I thought geometric abstraction offered a window into our Psyches. Each painting, contrary to popular opinion at the time, was produced in a totally uncontrolled and intuitive fashion. As each element/passage was painted it was taped off, and then covered by another layer of paint, which was in turn, taped and painted over in a process that usually consumed between 300-500 hours of work. Only at the end, when the painting was finished was I able to see, for the first time, the results of my efforts. I was privileged to be in Robert’s studio when some of these 70’s paintings were painted, particularly memorable are the” intergalactic traffic sign” series. They were bold and innovative then, as now, having passed the test of time with flying colors. They are emblematic of the unique and enigmatic individual who was Robert McCullough. I studied design under Robert McCullough and Mike Fanizza, and I’m grateful for that opportunity. Together they provided a perfect balance of design philosophy & practical application for those just starting out in the industry. Sure, sometimes Robert could be demanding, but his feedback could help take you to a higher level of proficiency if you were open to it. (If this comment was display size type, I’m sure he would recommend kerning.) 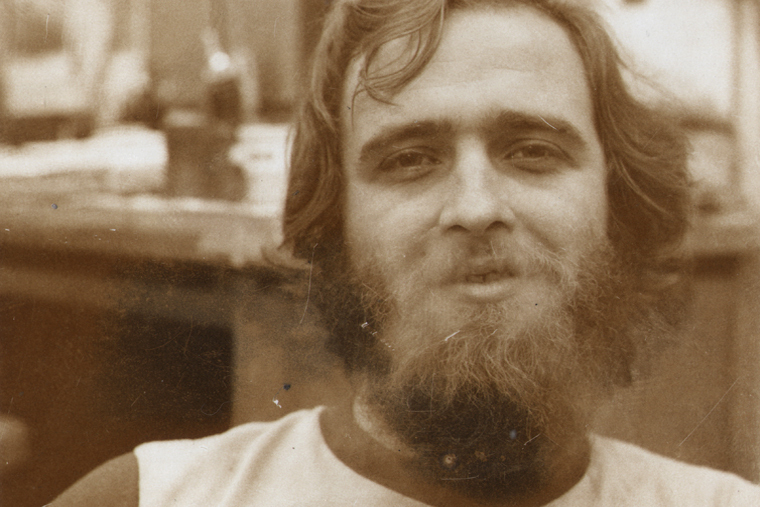 From the van he drove that became iconic among students, to his spectrum of varied works, we remember Robert McCullough and his impact on the design and art community.